Cruising the internet I found this youtube-tutorial, and liked the stitch/pattern right away. Although I have always had the impression that this qualifies as the moss stitch, I do not care about labels: I loved the youtube-“moss stitch” very much, and even more so after I had crocheted some squares using it. After showing my first couple of squares on Instagram, people kept asking for a “how to”, so here it is! You start any square, chaining 14+1 turning stitch, turn your work. * 1 slst, 1 hdc; repeat from * to the end of your 14 chains. Chain one (= turning chain), turn your work. 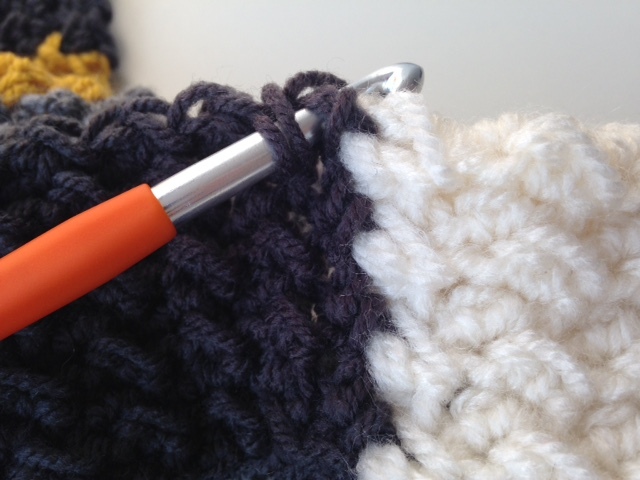 On every slst made, you will now crochet a hdc, on every hdc, you’ll crochet a slst, basically working the second (and all other rows) in the exact same way. Just keep in mind to alternate these two stitches at the start of every row. Slip stitches are only made behind the diagonal stitches from the previous row. Make sure to pick up both loops that are kind of hiding behind the diagonal loop. 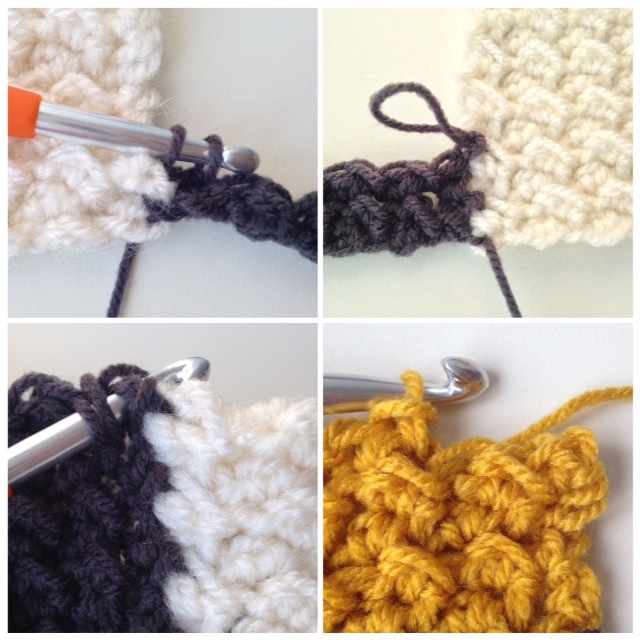 The half double crochet stitches are made in the two loops of the horizontal stitch from the previous row (sitting in between two diagonal ones). Isn’t it great that the combination of these simple stitches gives such a fab pattern and structure? Added bonus is the fact that there is no “front” or “back” – both sides are equally pretty. 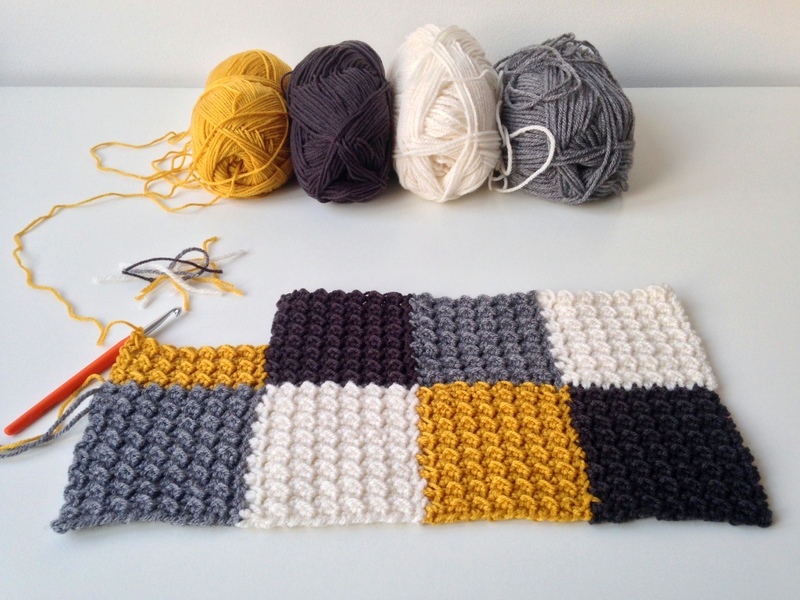 Ok, so you’ve made your first square – let’s continue! In the very first two loops/stitch of the chain of my first square, I attached the yarn for my new square with a slip stitch. I then crocheted 15 chains (14 + 1 turning st), turned my work and crocheted the pattern as described above (1 slst, 1 hdc, etc). As soon as I had crocheted the 14 stitches of my first row, I slip stitched into the opening right beneath the first diagonal stitch of the already finished square. Thisis your turning chain, so no additional turning chain is being made. Turn your work. Continue the pattern, row 2. When you have almost crocheted row 3 (i.e. 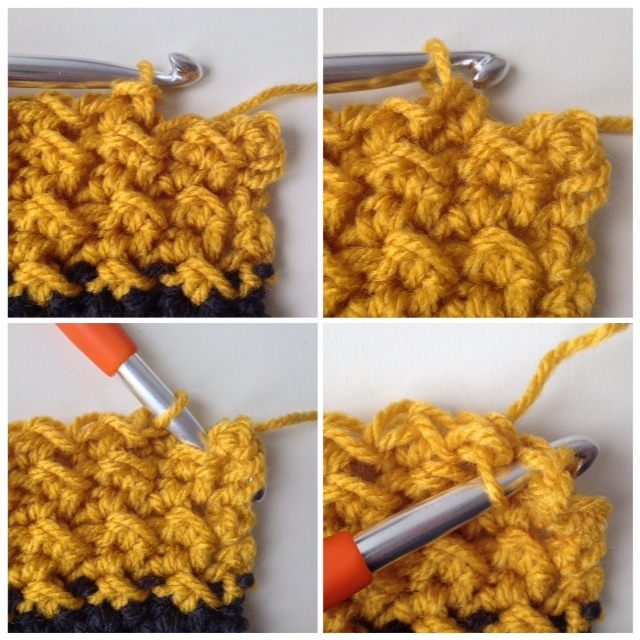 made your 13 slst/hdc’s), you must make sure you crochet your stitch 14 on/in the stitch that is actually the slip stitch of the previous round, the one with which you’ve connected your new square to the finished one. After that you’ll slip stitch again in the space right underneath the diagonal from row 4 of the already finished square, turn your work and continue. I’ve tried to make squares that measure 10 x 10 cm – a matter of trial and error/measuring as you go. As long as you make sure your chain-row has an amount of stitches that can be divided by 2 (not counting your turning chain), you can make your squares, blanket as small/big as you want. 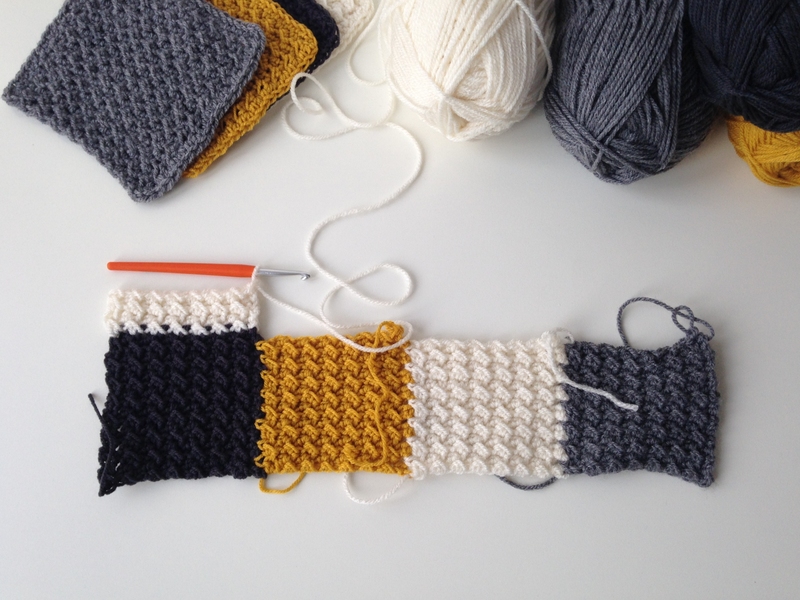 Also, by adding squares as you go, you can play with colors and size while you crochet – another win, I think. PS: In the meantime I’ve finished the “Dijon Blanket” (here) and even a second one, Baby Blanket “Gigi” (here).